The U23 team will file out fresh legs for the return tie of their U23 AFCON Qualifiers game against Libya in Asaba later today, coach Imama Amapakabo and his boys are faced with the task of wiping out a 0-2 loss suffered in the first leg. 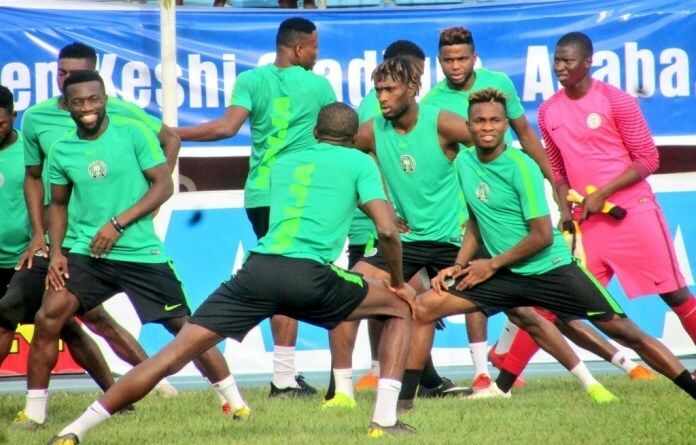 Already the coach has fortified the team with four players from the senior national team of Nigeria namely Chidozie Awaziem, Valentine Ozornwafor, Victor Osimhen, and Francis Uzoho. Taking a look at the possible five changes the coach will likely make to his starting lineup for the game ‎with some players who started the away fixture expected to miss out on the chance to start today. Francis Uzoho – His secondment to the team means he will start in goal ahead of Olawale Oremade who came in as a substitute for Adamu Abubakar who was red-carded in the first leg. Chidozie Awaziem / Valentine Ozornwafor – Central defence was one of the weak spots of the Nigerian team in the first leg tie. The duo of Joshua Akpudje and Stephen Egbe didn’t cover themselves in glory. Awaziem and Ozor0wafor are highly favored to start. Kingsley Michael – A surprise omission from the squad for the first leg although many suggested it was due to his late arrival. The on-loan Bologna midfielder who is now an integral player for Perugia in the Serie B should take the place of Kelechi Nwakali who failed to impress in the first leg. Victor Osimhen – Hard to imagine the 20-year-old who has 12 league goals for Charleroi where he is on loan from Wolfsburg not starting. Aside from the fact that he has played with most of the players in the team in the past, his style of play particularly his aggressive nature will no doubt unsettle the backline of Libya. Orji Okonkwo – Might likely get the nod to start with Osimhen in the attack. The duo were formidable as a pair at the 2015 U17 World Youth Championship and also during the ill-fated U20 Cup of Nations Qualifiers in 2016. A chance to rekindle their partnership is well on the cards with Taiwo Awoniyi likely to give way. Signing Neymar & Mbappe : Mission Impossible? Muyiwa is an ardent follower of everything football. Fascinated by the beauty of the game, he takes pleasure in penning down his opinion about a sport that has more lovers than haters. PS: He loves Barcelona for making football look easier than it actually is.